The 10W foldable solar charger takes you to the next level in portable solar power generation, increasing capability and charging speed. The 10W foldable solar charger provides you with a step-up in power point for solar charging small to medium electronic devices directly using the DC power or by utilizing one of many available accessories. Unlike "CIGS" solar technology, there is no need for "sun-soaking" the panel for optimum performance after periods of storage - so PowerFilm solar provides critical power immediately. 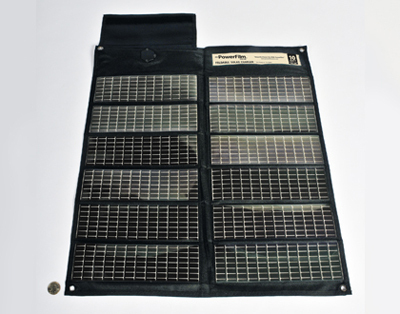 The PowerFilm 10 Watt Solar Charger is a foldable, lightweight, durable and extremely portable solar panel. The solar panels are mounted to a lightweight, weather resistant fabric that easily folds for storage and unfolds for use. The 10 Watt Foldable Solar Charger fits easily into most bags or rucksacks and weighsl ess than 1 pound, which makes it the perfect expeditionaryaccessory to provide power for a wide range of electronics. Unmatched durability allows for use in even the harshest environments and PowerFilm's proprietary processes produces a panel that works even after being punctured. Unlike "CIGS" solar technology, PowerFilm A-Si solar modules do not need to be "sunsoaked" after storage, they provide critical power immediately when placed in the sun. The included RA-212V adapter provides direct solar power to any car adapter with similar rated power to the solar panel.